At review time, the Tamron 18-270mm f/3.5-6.3 Di II VC Lens holds the world record for longest focal length range in all camera mounts it supports including Canon's APS-C mount. The 15x focal length range is, without a doubt, very impressive. It is definitely the highlight feature of this lens. Other nice Tamron 18-270 features include VC (Vibration Control), a modest size & weight and a reasonable cost. There is no perfect lens. All lenses represent a compromise of features - size, weight, price, focal length range, image quality, autofocus performance, build quality and other features. In a lens with a super focal length range, wide open aperture image quality is usually one of these sacrifices. And this is indeed the case with the Tamron 18-270. But it is not the only weakness of this lens. The Tamron 18-270mm f/3.5-6.3 Di II VC Lens review got off to a rough start. Canon camera and lens reviews are currently my top priority for the site, but I love evaluating the third party lenses as time permits. I had a block of time available between new Canon gear introductions and decided to try a group of super zoom lenses - including the Tamron 18-270 VC. Unfortunately, tested on two camera bodies, my first two copies of this lens had significant focus calibration problems at the wide end of the focal length range (one front-focused, one back-focused). The testing, returning and re-purchasing additional copies of this lens was time consuming, but alas, my third copy functions properly. As you probably deduced, quality control is apparently an issue for this lens. 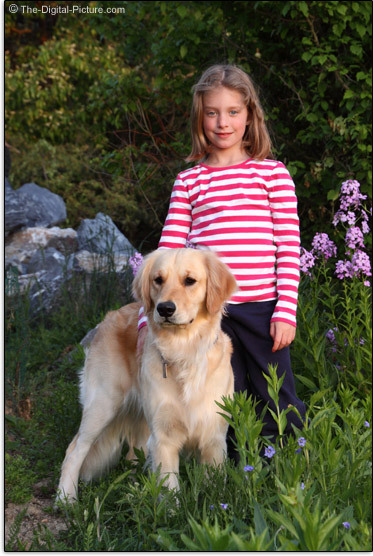 This casually-captured portrait of a dog and her girl were taken with the Tamron 18-270 VC mounted to a Canon EOS 50D. The focal length was 65mm, the aperture f/8 and the ISO was 320. A just-set sun provides the broad, warm-colored light. Though not exceptional overall, the Tamron 18-270mm f/3.5-6.3 Di II VC Lens' overall image quality is decent for a super zoom lens. Tamron 18-270 VC images are sharp in the center at 18mm with a wide open aperture. Stopping down does not improve center-of-the-frame sharpness. Corners are somewhat soft, but improve slowly through f/8 where the most of the frame is sharp. The bottom right corner shows improvement continuing at f/11. At 28mm, the center of the image frame remains reasonably sharp wide open, but the mid and corner areas of the frame are very soft. Stopping down the aperture to f/5.6 makes a significant difference in image quality and the entire frame is sharp at f/8. The wide open center-of-the-frame sharpness shows even further degradation by 35mm and the mid and corners remain very soft. Image sharpness improves significantly at f/5.6 and even more at f/8 where the entire frame is sharp. 50mm results are, across the frame, slightly softer than 35mm results. 70mm results are slightly softer yet wide open, but somewhat better stopped down. 100mm results are similar to 70mm results with the corners showing further degradation. 200mm results are similar to 100mm results with the mid-frame areas showing a little further sharpness degradation. Also, the left 20% or so of the frame is quite soft at f/8 and still soft at f/11. Again at 270mm, the mid area of the frame becomes softer yet. At 270mm, the entire image is soft wide open and especially soft in the mid and corner areas of the frame. The left 20% or so of the frame remains quite soft at f/8 and is still soft at f/11. The balance of the frame is reasonably sharp at f/8. In summary, the Tamron 18-270 VC is soft wide open and reasonably sharp when stopped down at least 1 stop or better yet, to f/8. Overall, image sharpness degrades as the focal length increases. For my tastes, this is an f/8 lens. My real world experience was not always as good as the lab image quality results. I suspect focusing errors came into play in these shots, but I could not confirm this from the specific shots I deemed not as good as they should be. CA (Chromatic Aberration) is somewhat strong in the mid and corner portions of the frame at 18mm, improves until CA is essentially gone at 50mm. By 200mm, CA is once again obvious and by 270mm, it is very strong. The Tamron 18-270mm f/3.5-6.3 Di II VC Lens' CA characteristics are in-line with the other currently available super zooms. Plan on needing to post process the long focal length shots (and possibly the wide ones as well) in your favorite non-Canon editing software to remove the CA. Distortion begins at 18mm as rather strong barrel distortion (moderately bulged-in-the-middle / wavy) that quickly transitions to neutral around 25mm and continues into mild pincushion distortion by 27mm. Pincushion distortion becomes strong by 40mm and slowly transitions back to mild at 270mm. Only a minor amount of vignetting is apparent in the corners of the frame at wide open apertures at the two ends of the focal length range. Bokeh (OOF background blur quality) seems reasonable for the lens class. I am seeing a bright rim around OOF highlights and some concentric rings inside. The Tamron 18-270 VC is not flare-free, but is closer to Canon's 18-200mm lens than to Sigma's super telephoto lenses. Like the rest of the super zoom lenses, the Tamron 18-270 VC is not a fast (wide aperture) lens. Utilizing a narrow max aperture opening keeps the size, weight and cost down. Also like the rest of the super zoom lenses, the Tamron 18-270 VC is a variable max aperture lens. Here is a table showing the focal length ranges for the max aperture of various 18-something mm zoom lenses. There is generally a 1/3 stop difference at most between these similar lenses. I don't see the differences influencing the purchase decision for most people. Holding a narrow aperture lens steady enough for sharp pics in low light can be a problem. Tamron uses VC (Vibration Control) to address this issue. This VC implementation is audible and not as well behaved as most of the recent lens stabilization systems I've been using - the viewfinder image frequently jumps when engaging, when disengaging and during lens motion. I needed a shutter speed of .4 seconds for a high percentage of sharp shots at 18mm. My sharpness rate was still good enough to go after shots at .6 seconds. I even have a very sharp shot taken 1.3 seconds. That compares to my needed 1/25 shutter speed without VC. At 120mm, 1/13 second was about my handholding limit with VC assistance. Without VC, I needed 1/120. And at 270mm, my Tamron 18-270 VC handholding limit is 1/30 second with some sharp images at 1/15. Without VC, 1/250 to 1/320 gave me a good keeper rate. As usual, my conclusion is that vibration control is very useful for handholding a lens in low light with a still subject (VC cannot stop subject motion). My testing shows that I personally am seeing about 3.5 stops of help from VC on this specific lens. The AF system is a Tamron 18-270mm f/3.5-6.3 Di II VC Lens weakness. I mentioned earlier in this review that I had to buy three lenses before I found one that was properly calibrated at 18mm. On top of this, AF is slow and audible. Focus accuracy has proven to be reasonable, though not perfect at the wide end. As usual for this type of lens, FTM (Full Time Manual) focusing is not enabled which also means that manual focusing requires the AF/MF switch to be positioned to the MF setting. And also as usual for non-FTM focus lenses, you need to keep your fingers clear of the MF ring as it turns during autofocusing to prevent damage to the internal gears. The zoom ring is adequately sized so this is not a significant problem during actual use. The Tamron 18-270 VC' manual focus ring is one of the worst I've used. To begin with, the MF ring has a short rotation between MFD (Minimum Focus Distance) and infinity (common for this lens class), which raises the need for precision focusing at longer focal lengths. Unfortunately, the 18-270's focus ring is very imprecise - it is spongy and sticky with play in the movement. On a positive AF note, the Tamron 18-270 VC is an internal focusing lens and filters attached to the front of this lens do not rotate (helpful when using certain types of filters including circular polarizer filters). All of the compatible APS-C Canon Digital SLR Cameras require a max aperture of f/5.6 for autofocus to function. The Tamron 18-270 VC autofocuses at all focal lengths including those with an f/6.3 max aperture on these cameras. Here is a comparison table showing the MFD and MM (Maximum Magnification) of some comparable lenses. Another great spec for a lens that attempts to be a one-lens solution - a .29x MM value. This is one of the best MM specs available from a non-true-macro lens. Tightly-framed pictures of medium-sized flowers are not a problem for this MM. Unfortunately, image quality at 270mm and MFD is not as impressive as the spec. 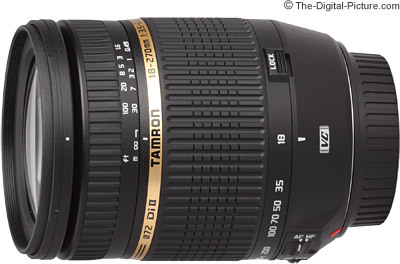 See the Tamron 18-270mm f/3.5-6.3 Di II VC Lens Specifications page to review more specs and comparisons. The Tamron 18-270mm f/3.5-6.3 Di II VC Lens gives the impression of a very nicely built lens when you pick it up. There is essentially no play in the extending barrel. Unfortunately, like the focus ring, the short throw zoom ring movement is rough. It frequently gets stuck and requires gravitational help to release it. And by stuck, I mean I'm putting a significant amount of rotational torque on the lens with no change in focal length. Enough force that I fear breaking something. As usual with a long-extending lens, gravity has an effect on the rotational force required to change focal lengths. Extending the lens when pointed downward is much easier than when pointed up - and vice-versa. Note that the 18-270 zoom ring rotates in the Nikon direction (opposite of Canon Zoom Lenses). A zoom lock switch is available to hold the retracted lens position (only). I do experience gravity-extending/zooming while carrying the 18-270. This happens most when the focal length is set in the mid to long focal length range or there is a little momentum behind the lens such as when lowered quickly. Gravity extending (or retracting) is especially a problem when shooting upward or downward from a tripod using a hands-off approach (carry some gaffer's tape). The included plastic hood is small - and as usual with this class of lens, will not offer much protection against flare at longer focal lengths. Protection from damage is always a good reason to keep it installed. Like the rest of the below-compared lenses, the Tamron 18-270mm f/3.5-6.3 Di II VC Lens' size and weight are very nice for take-with-you-everywhere use. Click on the image below to take a look at 5 super zoom lenses mounted to a Canon EOS 50D. Again, I don't feel that size and weight are good differentiators between these lenses. And the focal length range remains the most compelling reason to buy a super zoom lens. The Tamron 18-270mm f/3.5-6.3 Di II VC Lens is a "DI II" lens, which means it delivers an image circle designed to cover an APS-C (1.6x FOVCF) sensor. Unlike Canon EF-S Lenses, the Tamron 18-270 will actually mount to a full frame body, but there is significant vignetting. On an APS-C body, the 18-270's 35mm-equivalent AOV (Angle of View) equates to a drool-worthy 28.8-432mm lens. 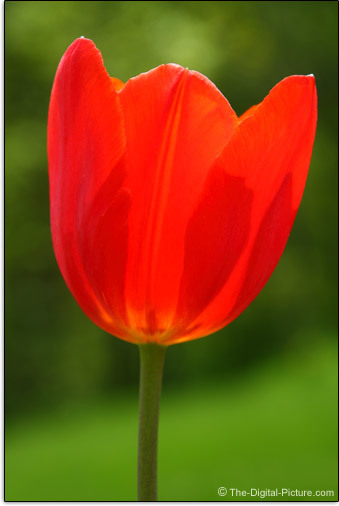 Below is an example of what this incredible focal length range looks like (use the mouseover links below the image). 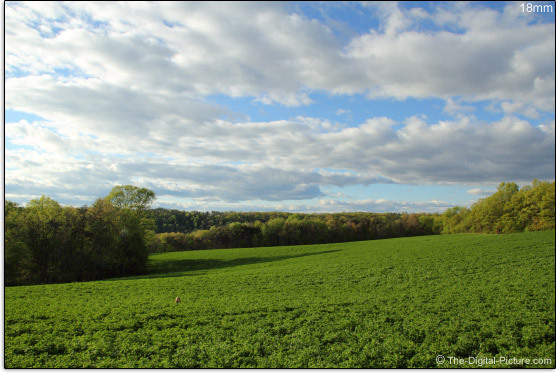 At 18mm, a small shape can be seen in what otherwise appears to be a landscape picture of a green field and partly-cloudy sky. Running your mouse over the "270" link in the mouse-over bar below the pictures clearly reveals the identity of this small shape. This is simply an impressive focal length range. 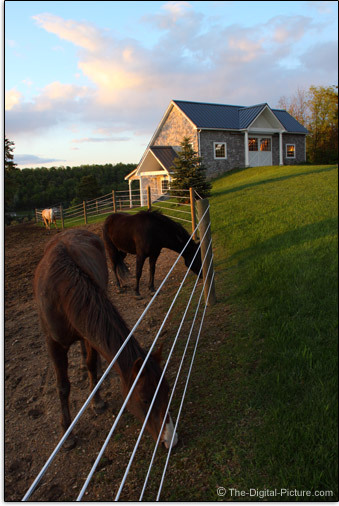 Pictures shot at 18mm with a close subject will give the viewer a sense of presence in the scene. 270mm will bring distant subjects in close - compressing the details in the image and potentially blurring the background. From moderately wide landscapes to portraits to wildlife photography, the right focal length is available in one lens. This focal length range is in-arguably excellent, but as we saw in the Canon EF-S 18-200mm f/3.5-5.6 IS Lens Review, all lens focal lengths at less-than-infinity focus distances are not necessarily equal. Focal lengths are rated at an infinity focus distance, but here is a table that shows the moderate distance required to frame a 47.25" x 31.5" (1200 x 800mm) test target at maximum focal length when mounted on an EOS 50D. Calculations based on the two prime lens figures indicate that 250mm should have a distance of about 531.1" (13,490mm) and 270mm should have a distance of about 573.6" (14,569mm). So, all of the zoom lenses seem to be similarly short of their named max focal length at this test distance, but the 250mm and 270mm variants do indeed have longer max focal lengths than the 200mm variants - which are similar to each other. Due to popularity, the super zoom lens market is a somewhat crowded one. And the extra 50-70mm max focal length is a product differentiator. Here is a visual max focal length comparison between these super zoom lenses. The above images were shot from a stationary EOS 50D with each lens set to the maximum focal length. They are listed from left to right in the order they were taken. The difference between 200mm and 250/270mm is noticeable, but not dramatic when looking at the overall range covered by these lenses. And regardless of their true maximum focal lengths at any distance, all of these super zoom lenses have an awesome focal length range. At review time, the Tamron 18-270mm f/3.5-6.3 Di II VC Lens is the highest priced of this group of super zoom lenses - before rebate. This lens has very consistently had a significant rebate available for it, bringing the price down below the Canon 18-200 but still above the Sigma 18-250. If you decide the irresistible focal length range is what you want, your next decision is - which is the best super zoom lens, overall? 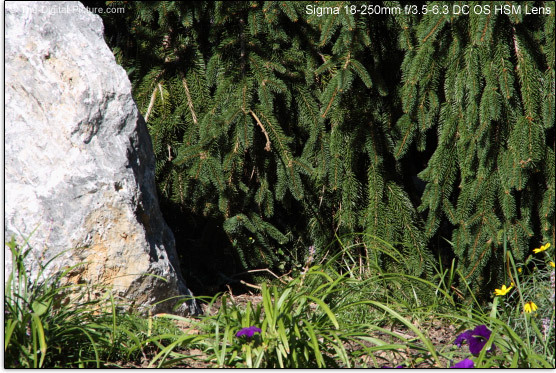 As I mentioned in the Sigma 18-250mm DC OS HSM Lens Review, I spent far more days than I want to think about trying to create a set of outdoor image quality comparisons to show you in addition to the ISO 12233 Chart Tool results. But thus far, I am not satisfied with how my test shots compare the complex image quality from these lenses. I may still add an outdoor comparison to this review, but in the meantime, I'll leave you with my personal preferences. I personally would give up some of the Tamron 18-270 VC's focal length range for the Canon EF-S 18-200mm f/3.5-5.6 IS Lens. I like how it performs overall best. My second choice would be for the Sigma 18-250 - primarily because of the AF and build quality advantages of this lens. The Sigma has less distortion than the Tamron, but the Tamron has less flare and at least as good or better f/8 image quality. The Sigma 18-200 OS and the Tamron 18-200 would be my last choices among the group of lenses I reviewed. The newer lenses are showing improved optical characteristics. The Tamron 18-200 is a really small, light and inexpensive lens - and has a really low price. This is one clear advantage it has. The Sigma 18-200 has OS. Like the other stabilized super zoom lenses, the Tamron 18-270mm f/3.5-6.3 Di II VC Lens, with a huge 15x focal length range and VC, is like two lenses and a tripod in the package of a medium-small lens (making it great for travel). And if you are willing to give up the ultimate image quality and wide apertures a multi-lens solution will provide for the convenience of a super zoom lens, the Tamron 18-270 is one of the top three Canon-mount models currently available right now. And for some, it may be a good choice. Even image quality aficionados can need a casual-use super zoom lens in their kits. At review time, the Tamron 18-270mm f/3.5-6.3 Di II VC Lens is available in Canon (tested) and Nikon mounts. Tamron USA offers an impressive 6 Year Warranty on this lens.